Check out Tobi's Bridget Stripe Wrap Skirt This striped mini skirt gets everything wrapped up. In crisp cotton, the Blue Bridget Stripe Wrap Skirt is a bodycon skirt in breezy, nautical stripes with a tie wrap detail at the front. With a halter top and strappy sandals, this front tie skirt made for sunny brunch dates. This striped mini skirt gets everything wrapped up. In crisp cotton, the Blue Bridget Stripe Wrap Skirt is a bodycon skirt in breezy, nautical stripes with a tie wrap detail at the front. With a halter top and strappy sandals, this front tie skirt made for sunny brunch dates. This striped mini skirt gets everything wrapped up. 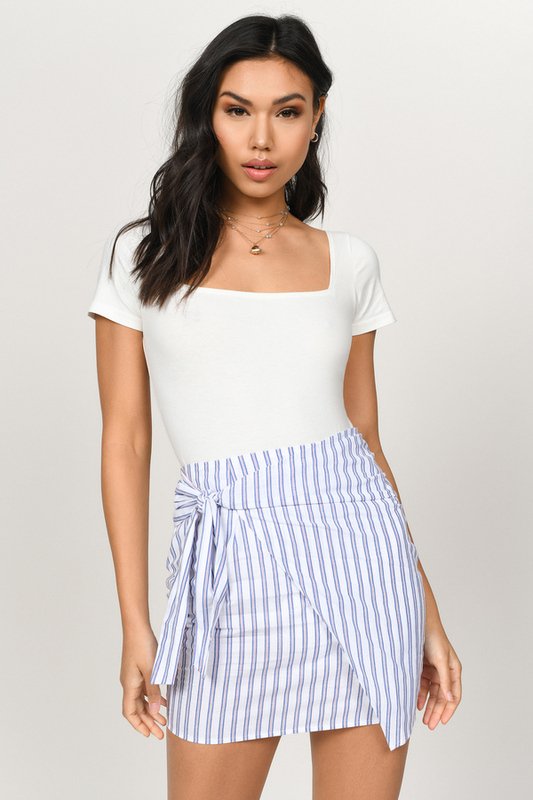 In crisp cotton, the White Bridget Stripe Wrap Skirt is a bodycon skirt in breezy, nautical stripes with a tie wrap detail at the front. With a halter top and strappy sandals, this front tie skirt made for sunny brunch dates.